Back in March I did a post about our Kitchen Must-Haves and our number one item is the cast iron fry pan. I figured it was time to go over how Hubby got this thing to where it is today. Seasoning is probably the most important thing when it comes to these types of pans. It’s the seasoning process that gets them to be nonstick and the cleaning that keeps them that way. New or old this is the process that we (and by we, I mean Hubby) took. Getting a cast iron pan to become come nonstick takes a lot of love, sweat and tears (of joy when it’s finally done)! Start with a pan that has a nice smooth cooking surface. Some new pans have a textured surface and these are no good! 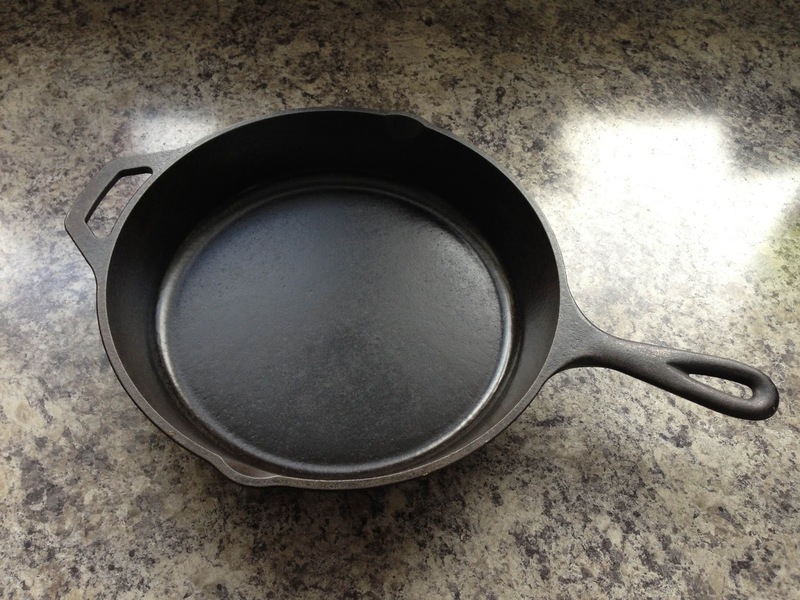 The best place to find a smooth cast iron pan is at an antique store, or maybe online? Start with a wet and soapy wire pad and scrub the crap out of the pan. I mean it! Really giver on that thing. Hubby probably worked on it for more than an hour. He got it down to where most of the black residue was gone and it had a nice silver colour again. Heat up the pan a bit to ensure its totally dry before continuing! Since we’re dealing with iron, its going to start rusting really fast once its dry… Gotta get through one seasoning cycle before its safe to leave alone. Using flax seed oil (because of its high smoke point) give the pan a super thin coat all over the cooking surface and sides. Try to wipe out the oil with a paper towel even to make it extra thin. Place it upside down in the oven and turn the temperature to 425f. Leave it in there for 2 hours, turn off the oven and just leave the pan in there to cool off. Repeat this oiling/baking at least four times, then its ready to use! The more you use the pan with care, the better its seasoning will become. To keep the seasoning perfect do not, I repeat, do not use soap. Ever. Sounds gross, I know, but using soap on seasoned cast iron is a big (and I mean big) no no! It will take away your hard-earned seasoning. If you are the type of person that lets dishes soak then I’m sorry but cast iron isn’t for you. Having water sit in the pan can make it rust. Eww. To clean the pan after use, just wait until the pan has cooled down then rise with water and wipe with a paper towel. If food is burned-on, then you’ll need to get that off. We, again Hubby (he’s the dish man), uses our super thin spatula to scrape anything off of it. I’ve read that you can use coarse salt too and for those of you that are grossed out by not using soap… that is your answer. The point is you need to preserve the nonstick surface. Then you must dry the pan thoroughly! Hubby puts our pan back on the stove for a few minutes on low. Lightly oil the pan and you’re all done! When you cook with cast iron, the food absorbs some of the iron which is healthy for you! This might all sound daunting, but it really is easy once you get to know your pan. It will become the pride of your kitchen in no time!